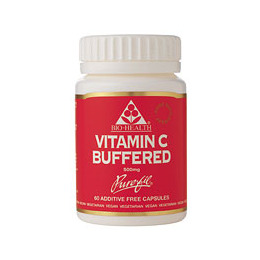 Vitamin C Buffered is a natural supplement that provides the body with Vitamin C which is considered to be the most useful of all vitamins for overall health maintenance. Bio Healths Pure fil capsules contain Vitamin C bonded with Calcium, making it non acidic. `PURE-FIL` products have NO artificial colours or flavours, synthetic preservatives, chemical excipients, binders, fillers or coatings and no added starch, sugar, salt, lactose, yeast or gluten. Encapsulated with; Vitamin C as Calcium Ascorbate, Vegetable hypromellose (HPMC). If you wish to take higher levels of Vitamin C we recommend Bio-Health’s Vitamin C Crystals. Below are reviews of Vitamin C - Buffered - 60 x 500mg Vegicaps by bodykind customers. If you have tried this product we'd love to hear what you think so please leave a review. I have been taking this form of Vitamin C for around 2 years now, it does not seem to upset my digestion and would certainly recommend it to others. Also pleased with service from bodykind, prompt delivery and reasonable price product. I shall definitely reorder. This is the only type of Vitamin C that my system can cope with. Without it I would no doubt have scurvy! Bodykind are quick and easy to deal with, and this is an excellent product. Vitamin C Buffered is a natural supplement that provides the body with Vitamin C which is considered to be the most useful of all vitamins for overall health maintenance. Bio Healths Pure fil capsules contain Vitamin C bonded with Calcium.